Touch enabled linux for mobile use!!
" The second image which i’m proud to announce today is the new gnome based ubuntu-mobile image that is targeting the bigger MIDs from 7-9″. This image is a first try and supposed to be the base for a well working touchscreen centric gnome mobile desktop on 1024×600 screens. " Testing started here too... prepare for videos.. I'd love to see this on the Gigabyte M912. 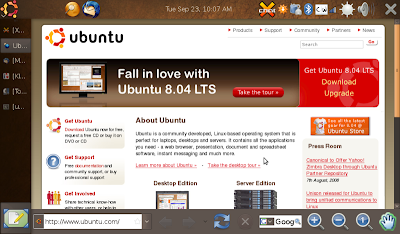 I can strongly recommend Ubuntu Eee if you haven't already tried it (http://www.ubuntu-eee.com). I installed this on my 901 2 days after I got it. It's a customised Ubuntu build for the EeePC and everything just works out of the box (wifi, webcam, multitouch etc - not sure about touchscreen though) and it has the Netbook Remix interface which looks great and works really well on a 9" screen. It can also run happily from an SD card or USB if you want to play around without wiping your current OS.